The New Orleans Saints have won two games in a row after losing their season opener. The first win was secured when Cleveland missed a potential tying field goal with three seconds remaining. The second win was secured on Drew Brees' touchdown to conclude the first possession of overtime, meaning the coin toss to start overtime might have been one of the most decisive moments in New Orleans' 43-37 triumph in Atlanta. 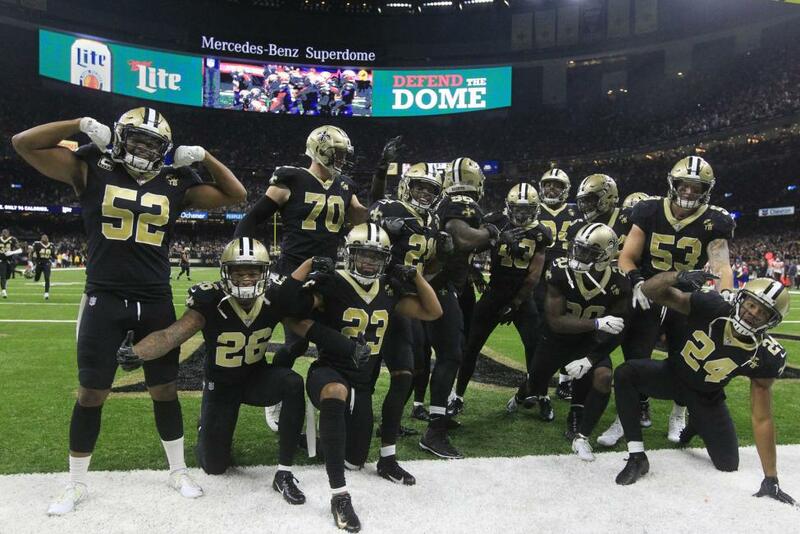 So the Saints are doing fine at 2-1 as they prepare to visit the New York Giants on Sunday, but the slim margin of the two victories demonstrates that there are short-comings to be addressed. "You are never happy completely," Saints coach Sean Payton said Monday. "You are happy to get the win and it was a big drive there, obviously in the overtime period to make it a sudden death (win). There's still a number of things that we have to work on to clean up." Most of those things are on defense and involve the passing game after Falcons quarterback Matt Ryan completed 26 of 35 passes for 374 yards and five touchdowns. The Saints have allowed 10 touchdown passes in three games. "Nothing surprises you in this game," Payton said. "You have to identify what you're doing. There's a mental error on one of the coverage busts. We have to look closely at that. We have to ask ourselves, are we doing too much? Are we putting our guys in the best position? That's one thing that is going to keep coming up now. "The deep balls are going to keep coming because if there's only two things happening, a pass interference or completion and there's no interception opportunity, then teams are going to take multiple shots more and more and more. I don't like the fact that we've had one takeaway after three games. I don't think we've caused a fumble one time. So there are a handful of things that need improvement fast." New Orleans overcame its defensive short-comings primarily because of Brees, who matched Ryan pass for pass. Brees completed 39 of 49 passes for 396 yards and three touchdowns. In addition to sneaking for the winning touchdown, he scrambled 7 yards for a touchdown with 1:15 left in regulation to force overtime. The tying drive lasted 5:43 and the winning drive lasted 7:05. "(Long drives) help you out defensively relative to time of possession and the total snaps you are defending," Payton said. "When you play a team like Atlanta and the game ends and the rushing yardage numbers come out (New Orleans 143 yards, Atlanta 48), part of that is time of possession related and so they were right at 29 minutes (29:20). I think we were at 37 minutes (37:45) and on the road that's a pretty good formula." --WR Cameron Meredith made his Saints debut and caught an 11-yard touchdown pass from Drew Brees. Meredith, signed as a free agent from Chicago in the offseason, was a healthy inactive for the first two games. --DE Marcus Davenport, the Saints' rookie No. 1 draft choice, got to Matt Ryan for his first NFL sack. Davenport is backing up Alex Okafor, but has been busy coming off the bench. --CB P.J. Williams made his first start of the season as the Saints looked for an upgrade over Ken Crawley, who was beaten repeatedly in the first two games. Williams wasn't any better as he was beaten repeatedly by Falcons rookie Calvin Ridley before Crawley replaced him late in the second quarter. --CB Patrick Robinson is likely to miss time because of a high ankle sprain, which put Crawley and Robinson on the field together in the Saints' nickel scheme. New Orleans might look around the NFL to see what cornerbacks are available. --WR Michael Thomas continued his record-setting start to the season He had 10 catches, giving him 38, the most ever by an NFL receiver after three games. His 28 after two games were an NFL record for the first two games of a season and his 16 in the opener were a franchise record for any game.